Left: Artist unknown [previously attributed to P.Wouwerman] Shoeing the White Mare, oil on canvas, circa 1640s, 1922/1/36. Collection of the Sarjeant Gallery Te Whare o Rehua Whanganui. Purchased on behalf of the Gallery by Mr and Mrs J.A. Neame, 1922. 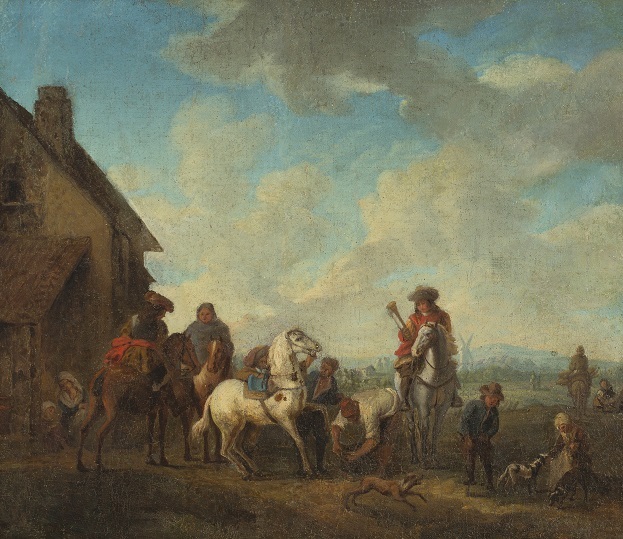 Right: Artist unknown [previously attributed to P.Wouwerman] The Hunt, oil on canvas, circa 1640s, 1922/1/37. Collection of the Sarjeant Gallery Te Whare o Rehua Whanganui. Purchased on behalf of the Gallery by Mr and Mrs J.A. Neame, 1922. The world of art attribution can be a challenging and mysterious one and most galleries have at least one art work with arguable attribution. What is attribution you ask? It is the artist believed to have created the art work. Most attribution is established through provenance; that is the paper trail documenting the journey of an art work from when it left the artist’s studio to when it found its way into a gallery collection. Unfortunately sometimes provenance is lost and an attribution once believed to be bona fide is subsequently questioned. The world of artwork attribution is particularly challenging when discussing the Dutch masters of the 17th century. The Sarjeant Gallery has two Dutch works in its collection originally purchased by Henry Sarjeant’s widow Ellen Neame. Ellen remained a patron of the Gallery after her husband passed and travelled to Europe where she purchased pieces for the Sarjeant Gallery collection. The two works in question, Shoeing the White Mare and The Hunt were both purchased by Ellen in 1922 and attributed to Philips Wouwerman. Wouwerman was considered the greatest Dutch equestrian painter of the 17th century. In the 18th and 19th centuries his works became very popular with collectors and were acquired by many galleries throughout Europe including The National Gallery in London and The Museum of Fine Arts in Germany. This probably explains why Ellen Neame was attracted to these two pieces. In many ways they are typical of Wouwerman’s work as they are the right size, the right age and the right subject matter, however they are not signed and not entirely typical of his compositions. Perhaps it is for these reasons that in 2011, during a routine valuation, Christie’s valuers questioned their attribution. In 2012 the decision was taken to remove the attribution of Wouwerman. While this decision may have made the works less financially valuable, in many ways it makes them more interesting. During the Dutch Golden Age, Dutch painters were considered the best in Europe and art dealers flocked to Amsterdam to acquire works. The Dutch apprentice system meant that many works were incorrectly attributed to master rather than their student. There was also the problem of similar names and signatures creating confusion. Non-Dutch painters tried to emulate the Dutch style and adopted Dutch sounding names to make their own work more desirable and to top it all off Wouwerman’s father and two brothers were also painters, painting under the name Wouwerman. For this and a myriad of other reasons the field of attribution, when it comes to Dutch paintings of the 17th century, can be exasperating. 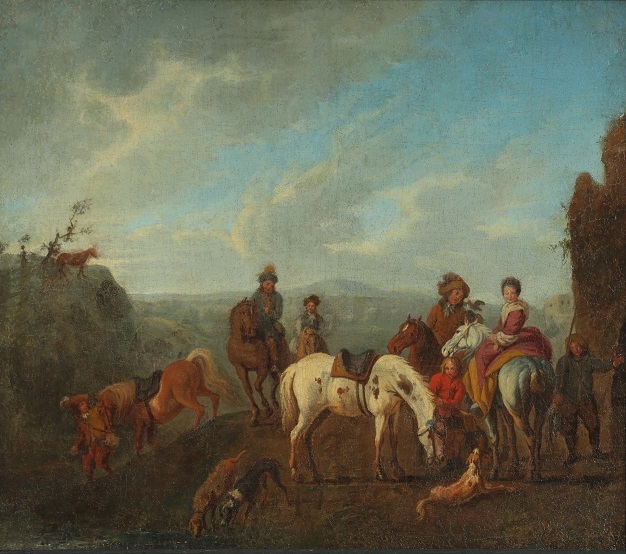 We may never know who actually painted these two works but they stand not only as fine examples of the Dutch Equestrian style by also as fine examples of their era, in the style of or perhaps by Philips Wouwerman. Shoeing the White Mare and The Hunt are currently on display in Revealed – collection discoveries from our recent move until 18 September 2016. The exhibition shows some of the works that were uncovered during the 2014 – 2015 relocation of the collection from the Gallery’s earthquake prone heritage building at Queen’s Park to our temporary site at Sarjeant on the Quay.